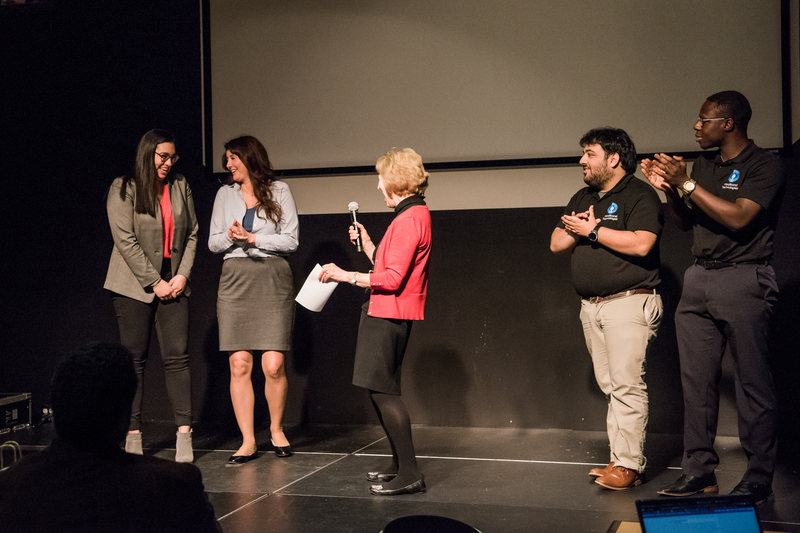 UMBC’s Idea Competition offers students from all fields an opportunity to present business ideas to a panel of expert judges and receive immediate feedback on moving from vision to reality. The university’s Alex. Brown Center for Entrepreneurship hosts this competition each fall. This year’s event featured ten project finalists. Student teams had just three minutes each to sell the judges and the crowd on their innovative product and business ideas. While the Idea Competition can be intense, the organizers also focus on providing support for the emerging student entrepreneurs who participate. Local entrepreneurs on the judging panel don’t just evaluate the finalists’ ideas; they also provide advice on next steps. The ideas presented this year ranged from technology to make schools safer from physical threats to wearable technologies that can help people in their daily activities. One team presented materials that can help clean up contaminant spills in the environment, while another shared homes built from 3D-printed materials. Jood Ali ‘20, mechanical engineering, submitted an idea called ReActive, along with her project partner Nila Lahijan ‘19, biological sciences. ReActive combines electronic muscle stimulator technology with compression clothing. Ali shared how her personal experience with physical therapy inspired her to look closer at these two technologies, which aided her recovery from an injury. She wondered if they could be made more portable and wearable. Jood Ali, left, is announced as the first place winner of the 2018 Idea Competition. Ali described how electronic muscle stimulators deliver electrical current to the body through electrodes that are placed on the skin. Both these devices and compression clothing are commercially available, but, Ali noted, the technology has not been combined in this innovative way to help people receive the benefits of their physical therapy while on the go. Michael Ogunsanya ‘21, mechanical engineering, and Eric Solender ‘21, information systems, presented MindStand Technologies, which works to foster healthy online communities by identifying and preventing harassment.Ogunsanya, Solender, and their team are using artificial intelligence informed by clinical psychology to determine the intent and content of messages, and flag concerning material. Their project earned the second place prize ($500) in the competition. Eric Solender, right, answers questions from the audience during the competition. 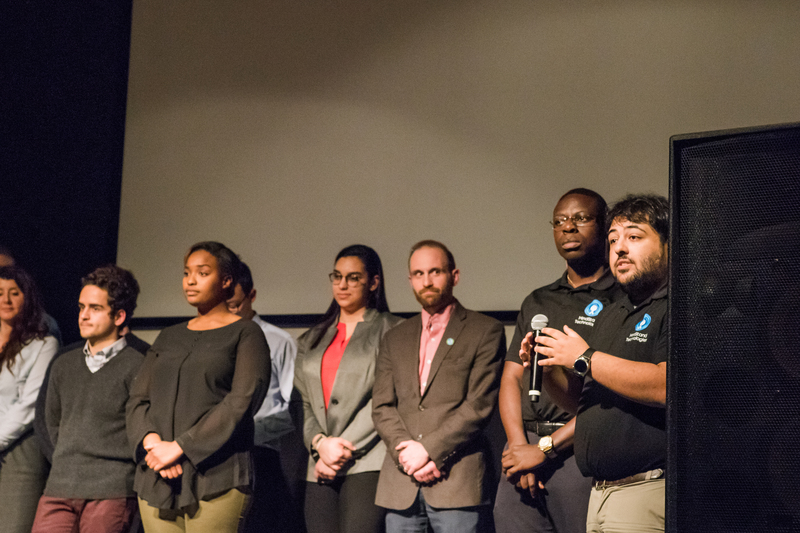 The students shared that a key distinction between MindStand and its competitors is the ability to process full-length conversations, rather than relying on keyword searches to flag cyberbullying and harassment. They explained that the technology they are developing can also get professionals and administrators involved, through interactive dashboards and email notifications, to address bullying behaviors. Solender and Ogunsanya are working with UMBC’s Division of Information Technology to explore implementing the MindStand Technology on the myUMBC platform. Jen Spiker ‘21, information systems, presented her business idea, 3D Printed Home, which won the third place prize ($250) in the competition. Inspired by how the military is using 3D printing technologies to construct barracks, she developed a proposal for printing homes in as little as 24 hours and for the price of a car. Spiker hopes her work can help reduce homelessness and expand affordable housing options in the United States. Jennifer Spiker, left, answers questions during the competition. The business pitches were judged by Sean Booker ‘04, computer engineering, president and CEO of Booker DiMaio; Eli Center ‘01, political science, president and CEO of 4S-Solutions, LLC; and Paula Kipperman, president of United World Technologies, LLC, located in bwtech. 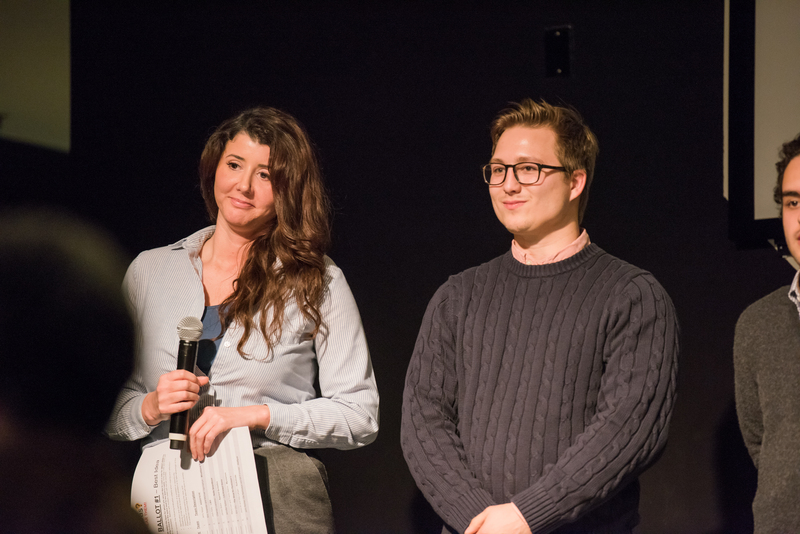 Banner image: Jood Ali (left), Jennifer Spiker, Eric Solender, and Michael Ogunsanya after the Idea Competition. All photos by Marlayna Demond ’11 for UMBC.